There are many birds at the REGI facility in Antigo. At least some of those birds are "odd" or different in some way. 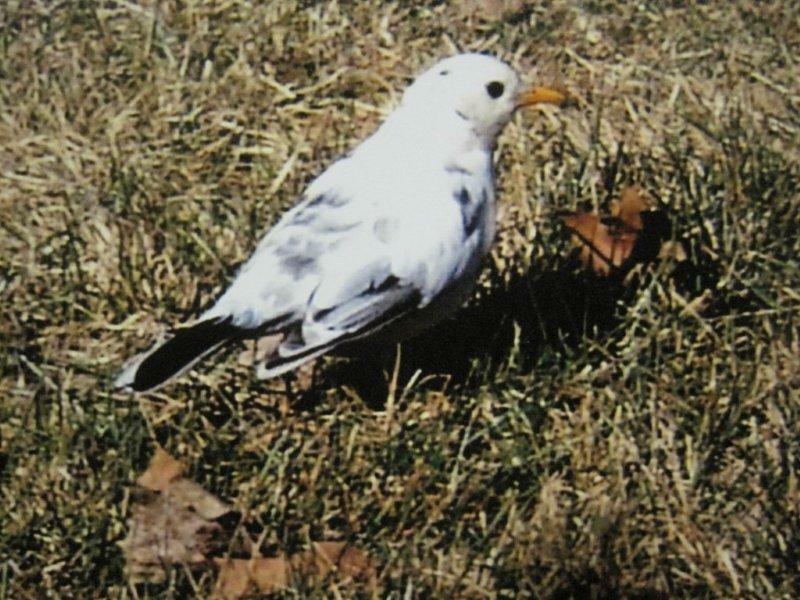 Recently, some truly atypical birds showed up. 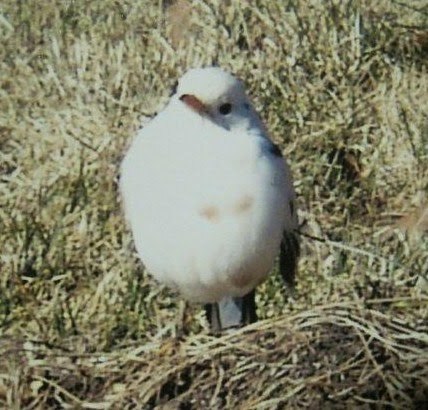 The bird in the photo above and below is a wild bird. he showed up a few weeks ago on the property of a friend of REGI. At first no one could figure out what the bird was. It was seen only as a flash of white, which would quickly vanish. I finally had the opportunity to see the bird "in the feather" so to speak. The verdict is he is an American Robin in atypical plumage. 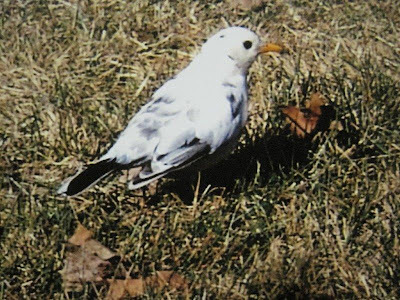 He happens to have many white feathers. There are a few deep rust colored feathers on his chest. His primaries are a natural color. We are anxious to see if he nests in the area and if so, if any of the offspring will sport any atypical feathers. 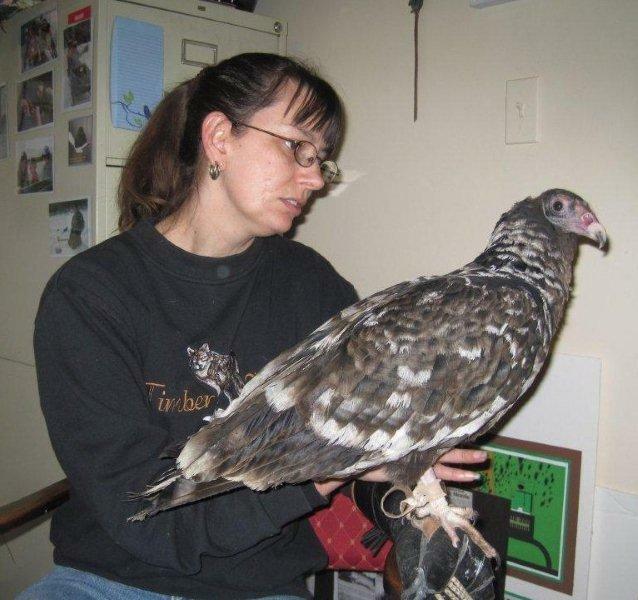 Several months ago Cheryl Diehl, from Wildlife In Need, a wildlife facility in Southern WI called to say they had an atypical Turkey Vulture patient. The youngster was admitted with starvation and was in poor body condition. Due to the birds poor condition, and the fact that Turkey Vultures migrate to warmer climates, this patient had to be housed indoors for the remainder of the winter. Cheryl wanted to know if we had room in our winter indoor quarters. We agreed to take the little one, care for him, and try to figure out what was up with his unusual appearance. There are many things that can affect a birds plumage. Some researchers feel nutrition has something to do with the quality of feather and perhaps the color as well. English Sparrows for instance occasionally have white feathers. It is sometimes attributed to city birds eating bread or a poor diet. The truth is we are not sure why this occurs. It is atypical to be sure. The interesting news on the Turkey Vulture is it is molting in new feathers. The new feathers are also white. It will be interesting to see how he turns out for the future.